I don't know how many of you participate in craft fairs and bazaars, but one thing that I have decided to do this year is make my sewing hobby more self supporting. I don't dream of making millions of dollars selling my handiwork, but it would be great if I could earn enough to buy fabric. 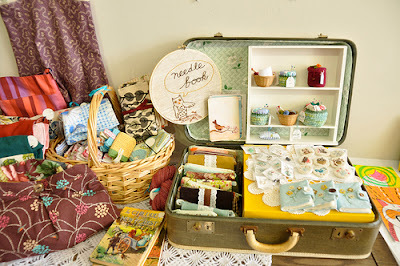 Starting February, I am going to be participating in a gift bazaar in my home town. The booth rental is fairly inexpensive, and it will be good for me to put myself out there. I will be responsible for furnishing and setting up my display space. I wish that I could say that I had everything figured out, but I don't. I've been searching the internet for some inspiration. Here are a few displays that I responded favorably to. 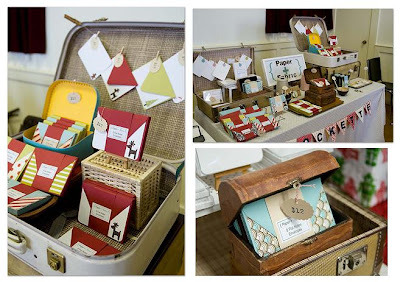 I love the idea of using old luggage as a display prop. It is a lovely display, especially when it is paired with that miniature shelving unit. I've been trying to think of ideas for hanging and displaying items. 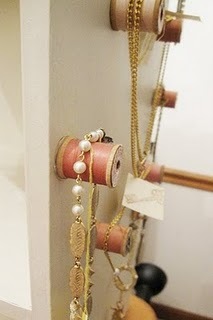 I'm not interested on spending a lot of money on display items, so this use of wooden spools is right up my alley. It's lovely, and by Good Girl's Studio. I thought that this was a very interesting use of an old TV Stand. The bright color is sure to draw attention, and it makes that colored card stock look like candy. 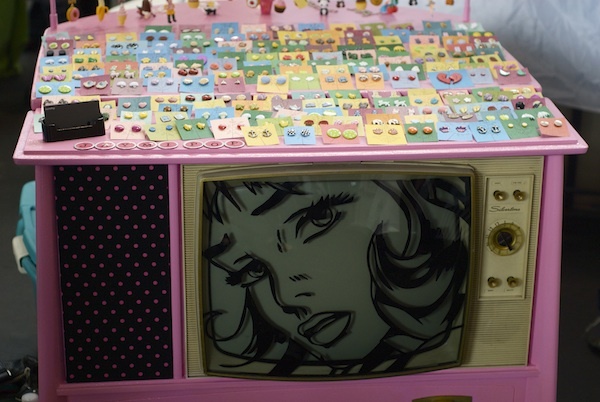 This TV Stand is by Jaymi Pop. I just purchased an old desk that is in need of some serious attention, any suggestions on color? Here's another example of old luggage. I think that the stationary looks lovely all packaged up. The miniature clothes line is a cute touch as well. This display is by Lockette. Price tags....I need to think about that as well. While I don't think that I'll be using any egg cartons in my display, I do love how this carton gives each individual ring a home. I have some headbands that I'm going to have available, and I can't figure out the best way to display them. 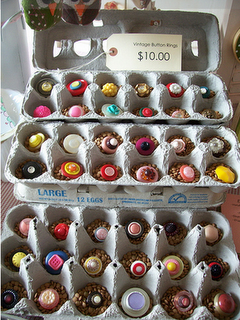 Egg Carton display, and vintage button rings by Whimsy Love. I like that this display by Viridian includes a curtain. It is a great way to make the customer feel at home, but also block out a bit of the background (so that they can focus on your shop). All of those displays look like booths that would draw me in to look. I really love that last one especially. Oooh, talk about a new challenge. 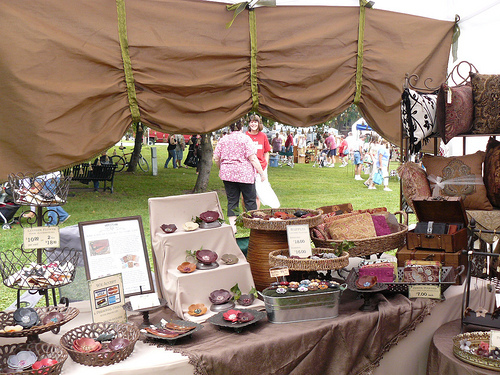 Are you going to be selling your stuff at the Mini Bazaar? I'd love to come see it sometime! :-) Have you seen Kim (Stimpson) West's craft blog yet? She's got some great ideas for hanging headband organizers, they might be something that could help you display yours...Good luck! How fun! You'll be great at a craft show. One tip I got from a friend who does lots of shows is to get your products up off the table, bring them up to eye level, especially the smaller items. I've seen people use the frame/spring thing from an old crib and clothespins, but anything really seems to work. Good luck! I want to take my handmade hobbies to another stage and looking around your blog has inspired me even more to carry on!!! Thank you for sharing some ideas. Great job.